Frosty! This theme is sure to give you some goose bump. The clean transparent look of this Windows 7 theme is exactly what I have been looking for so a long time. 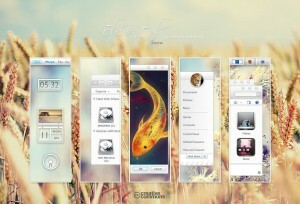 I like the colors and how they flow with all the other elements of this theme, like the buttons. Another great theme from this designer. Are you more of a sleek mysterious person? 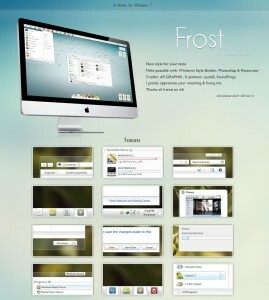 Then you’ll have to download this must have theme. With the cool dark taskbar and windows and the unique start button this theme is sure to please. My favorite part of this theme is how everything comes together in a wonderful display of artistry. If you’re looking for the best theme of 2011 then you’ve come to the right place. 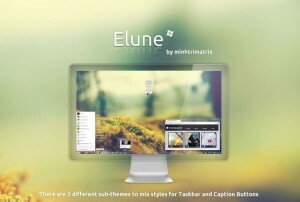 This Elune theme for Windows 7 is sure to be a keeper. The newly designed buttons and windows looks great and the effects that are included in this theme are subtle but effective. This design is fast becoming the premier theme designer of the year. Great job. 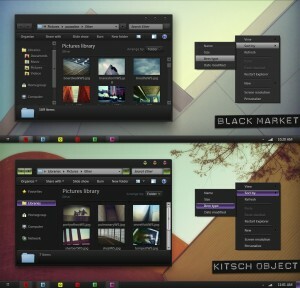 This wonderful theme has a soft feel to it and it really is a nice change from the usual look of Windows 7. It’s simple and unique and it looks almost like a mac os. Viewing this themes makes your feel like you’re in a cloud with all the soft hues. The only negative of this theme is the lack of sharpness of the corners but otherwise it’s great. This dark and metallic Windows 7 skin is definetely a step away from the typical themes we see, but it really has a great design. The design is not over done or too cluders with stuff and the main windows buttons are light enough for most users. 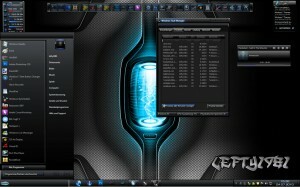 The blue light background is really the focal point and makes this theme usable as it adds some much needed light. This is a wonderful example of a tech/industrial design.